Over the last twenty five years the work done in the Dow's vineyards and in the Dow's wineries has resulted in constant improvement to the quality all the houses premium Ports. Nowhere has this investment been more in evidence than in the quality of Dow's Late Bottled Vintage Ports (LBV). Dow's LBV is full-bodied, rich but perfectly balanced with soft peppery tannins and with a fine acidity that ensure perfect balance on the palate. 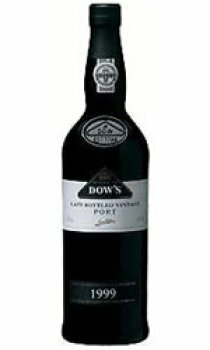 The classic Dow's dry finish is always present in the house's LBV; it is one of the finest LBV Ports available. Dow's LBV has consistently won more awards that most other LBV Ports on the market and this wine has become recognized around the world as an industry standard for excellence, it is served in countless fine restaurants, on several major international airlines and most importantly it is widely appreciated by consumers in many countries around the world.